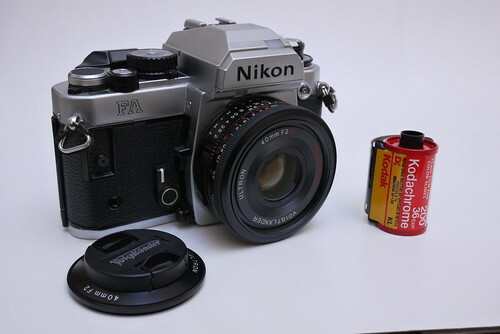 The Nikon FA is a 35mm manual focus SLR camera introduced in 1983. This camera features a programmed auto exposure, aperture priority, shutter priority and manual exposure. A newly designed TTL automatic multi pattern matrix metering type system was introduced in this camera with a traditional center weighted mode also available. The shutter is vertically traveling electromagnetic controlled with step less speeds of 1 to 1/4000 sec. The x sync is at 1/250. 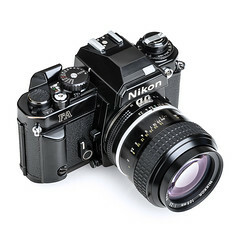 This cameras also introduced the AI-S F-mount lenses. It is powered by 2x 1.55V S76; 1.5v LR44 or 1x 3V CR 1/3N. This page was last edited on 12 January 2018, at 06:32.